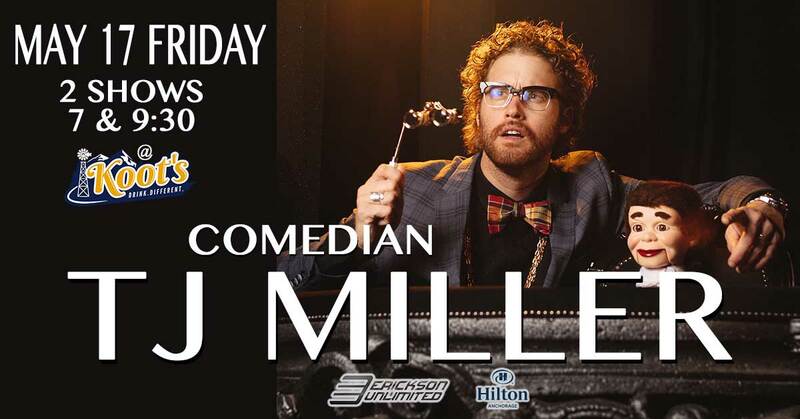 Comedian TJ Miller comes to Koots for 2 shows only May 17th. You know him as Weasel from the Dead Pool movies, and starred in the movie Office Christmas Party, HBO's Silicone Valley, Transformers Age of Extinction and his HBO comedy special Meticulously Ridiculous. ** Doors open at 6pm for the first show and we'll start seating people for the 9:30pm show after we've cleared the room from the first show. ** It's general admission seating. ** 21 and up show. This is an Erickson Unlimited Production.